This is the first major exhibition in the UK by the Chinese artist, Song Dong. A poignant meditation on family life and the artist’s own childhood during the Cultural Revolution, the installation comprises over 10,000 items collected by Song Dong’s mother, Zhao Xiangyuan, over five decades – ranging from a section of the family home, to metal pots and plastic bowls to blankets, bottle caps, toothpaste tubes and toys. The activity of saving and re-using things is in keeping with the Chinese adage wu jin qi yong – ‘waste not’ – a prerequisite for survival during periods of social and political turmoil. Ed Atkins, Omer Fast, Ruth Ewan, Dani Gal, Glenn Ligon, Mary Reid Kelley, Anri Sala, Alexandre Singh and Ryan Trecartin. Image (top): Glenn Ligon, Warm Broad Glow II, 2011. Courtesy the artist and Zabludowicz Collection. Zabludowicz Collection Invites is a new initiative dedicated to presenting young, UK-based artists who do not currently have representation by a commercial gallery in the UK. Taking the form of monthly solo presentations, exhibitions will result from an open-ended invitation to exhibit new work. Hannah Perry works in video collage and installation. She recently performed as part of Lucky PDF’s residency at the 2011 Frieze Art Fair, and has presented work at A Foundation, Liverpool, Focal Point Gallery, Southend-on-Sea and Tate Britain, London. Image: Hannah Perry, Wonderful While It Lasts, 2012. Courtesy the artist and Zabludowicz Collection. This will be the first solo exhibition of Franz Erhard Walther in the UK. The exhibition will include ground-breaking work from the late 1950s, 60s and 70s together with the artist’s latest retrospective and autobiographical drawing project – Dust of Stars. A Drawn Novel. The graphic novel sheds light on the ideas and motivations informing his life-long practice and, in particular, the importance of drawing. Walther began to experiment with ways to actively involve spectators in the production of the work in the late 1950s. At this time he produced ‘word’ pictures in a bid to force the viewer to create their own image. In the early 60s he began to experiment with paper as the work itself rather than as a ground, displaying the work in stacks that the audience were invited to leaf through, or large books with which they could interact. Hundreds of Work drawings were produced before and after these actions and a selection will be included in the exhibition. Image: Franz Erhard Walther. 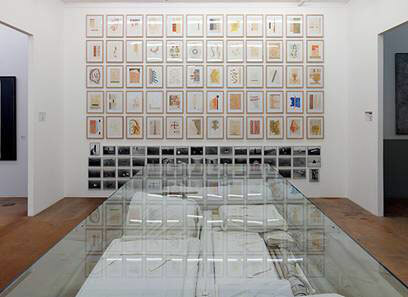 On wall: 60 Werkzeichnungen (60 working drawings), 1963–72. Installation view at Mamco, Geneva with First Work Set (stored) in foreground. ARTIST ROOMS returns to Tate Liverpool in 2012, with a display of seven important works from Turner Prize winning artist Martin Creed. These works have recently been donated by Creed jointly to Tate and National Galleries of Scotland for the ARTIST ROOMS collection. Creed is the first new contemporary artist to join the collection since it was established in 2008. Refreshing, unexpected and humorous, Creed’s work challenges our preconceptions and rearranges the rules of conceptual art. 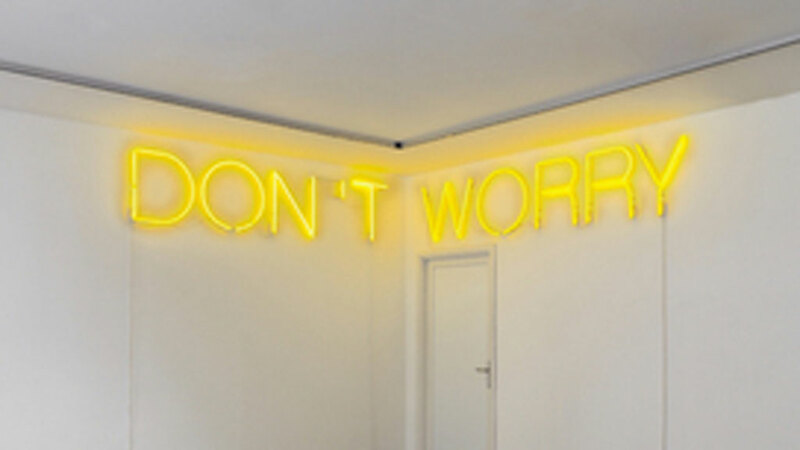 Image: Martin Creed, Work No. 890, DON’T WORRY 2008. © Martin Creed Courtesy the artist and Hauser & Wirth. Photo: Mike Bruce. Black Country Stories brings renowned Magnum photographer, Martin Parr, on a photographic journey across the Black Country. Starting in 2010 and finishing in 2014, Martin is visiting markets, temples, factories, social clubs, tea dances, dog training classes, summer fetes and a whole mixture of other places in Sandwell, Walsall, Wolverhampton and Dudley. Eastside Projects and Grizedale Arts presents Yangjiang Group’s first solo exhibition in the UK. ‘After Dinner Shu Fa at Cricket Pavilion’ is a performative installation and event series developing post-planning social shu fa as a space for hosting, cooking, eating, photographing, and watching cricket! Shu fa is the Chinese art and theorem of writing, traditionally known as calligraphy, which Yangjiang Group utilise as a unique form to develop diverse contemporary art practices and experiences. The goal of the group is to rebel against the traditional situation of calligraphy in new China. Yangjiang Group is an artistic group founded in 2002 by Zheng Guogu, Chen Zaiyan and Sun Qinglin in Yangjiang, a large new city developed from a small ancient town situated in the south of the Guangdong province – the avant-garde region of China’s modernization, urbanization and globalization. Yangjiang Group are designing and building a new large-scale artwork based on a traditional Chinese tea pavilion as the focal point of the exhibition in Eastside Projects. Visitors are invited to use the ten metre square, four metre high wooden and plastic pavilion, and can climb the first floor to view eating and calligraphy in the gallery. Using Cerith Wyn Evan’s ongoing investigation of architecture as a starting point, and specifically curated as a response to the De La Warr Pavilion, the exhibition will consist of three major installations and smaller new works dispersed throughout the building. Taking the entire Pavilion as an opportunity for installation, including our two gallery spaces and the roof-terrace, the exhibition will provide the impetus for a wider programme of related live art, music, performance and film. The artist will strip back the Pavilion’s gallery spaces so that they are for the first time undivided. With all windows revealed, the installation explores the relationship between manmade and natural light and returns the building’s structure to its original purpose – as a space for visitors to experience and enjoy. Described by the artist as “a love letter to the building”, the exhibition will embody many recurrent themes within Evan’s art: including code, language, text and an interrogation of aesthetics. 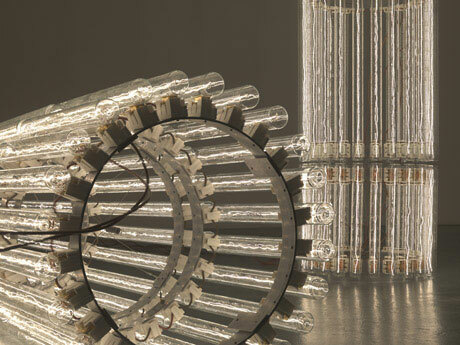 Image: Cerith Wyn Evans, Assemblages VIII, 2010. White Cube Bermondsey, 2011. © The artist. Photo: Ben Westoby, courtesy White Cube. In his largest UK exhibition to date, award winning artist Gaillard presents two major film installations. These cinematic works show contemporary architecture as a modern ruin on the verge of being taken over by nature. Real Remnants of Fictive Wars (Part V) is a slow film of fire extinguisher smoke engulfing a romantic landscape, as a violent and mesmerizingly beautiful act. Cities of Gold and Mirrors brings together archaeological and human ruin in its hypnotic depiction of the ancient city of Cancun. Curated by AV Festival in partnership with mima. 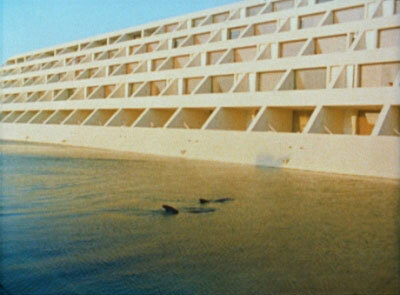 Image: Cyprien Gaillard, Film still, Cities of Gold and Mirrors, 2009. Courtesy the artist and Sprüth Magers. Phyllida Barlow is an artist and teacher who constantly questions the possibilities of sculpture by capturing a sense of the ‘now’. This exhibition presents a selection of recently acquired drawings from the sculpture collection of Leeds Museums & Galleries, which is managed in partnership with the Henry Moore Institute; a collaboration that has built one of the strongest public collections of sculpture in Britain. Known primarily for her large-scale installations made from salvaged materials that are constructed on-site, Barlow has a continuous practice of drawing, which she uses to explore and record her visual ideas. Describing them as ‘bad copies’, Barlow’s drawings are often derived from her environment, but never drawn from life; they range from swift biro and pencil sketches in notebooks and diaries, often appearing beside domestic reminders and lists, to more heavily worked acrylic drawings and oil paintings, which experiment with surface textures as well as colours, forms and arrangements.